The intricacies and importance of human interaction are celebrated in Lee Mingwei and His Relations: The Art of Participation which opens this Saturday 5 November at Auckland Art Gallery Toi o Tāmaki. Through the installations of Paris-and New York-based artist Lee Mingwei, visitors to this powerful exhibition are invited to slow down, engage and converse – to create new memories or recall old ones. Visitors can write a letter, offering previously unexpressed gratitude, forgiveness or an apology, in The Letter Writing Project (1998–present), or bring in a garment to be repaired while engaging in conversation with the mender in The Mending Project (2009–present). Auckland Art Gallery Director Rhana Devenport says this exhibition provides the first opportunity in Australasia to experience these participatory artworks within a single exhibition. ‘Although the form of audience involvement varies across the different artworks, all visitors are invited to participate as much as possible,’ she says. In a first for Auckland Art Gallery, visitors can enter a ballot to spend a night in the Gallery while participating in The Sleeping Project (2000–present). Guests will sleep soundly surrounded by further artworks alluding to sleeping and the night by celebrated artists such as Colin McCahon, Dane Mitchell, Fatu Feu’u, John Webber and William Blake. The art of gift giving and gratitude is also celebrated in this exhibition with Sonic Blossom (2013–present) in which singers approach people at random in the Gallery and offer them a gift of song. If the visitor accepts, the singer then leads them to the Mackelvie Gallery and sings to them a Lied (art song) by 19th-century composer Schubert. Alongside further projects, including 100 Days with Lily (1995), Nu Wa Project (2005), and Stone Journey (2009), selected relational artworks provide an artistic and philosophical context to Lee Mingwei’s practice. These include works by and references to artists Hakuin, John Cage, Allan Kaprow, Yves Klein, D T Suzuki and Lee Ufan. Together they act as touch points to the ideologies and sensibilities that inform Lee Mingwei’s intimate way of working. The exhibition is organised by Auckland Art Gallery Toi o Tāmaki and Mori Art Museum, Tokyo, with Curator Mami Kataoka, Chief Curator of Mori Art Museum, Tokyo. 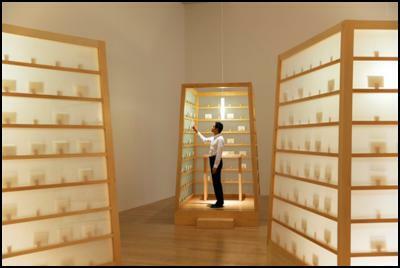 It was previously presented at Mori Art Museum and the Taipei Fine Arts Museum in Taiwan. Mami Kataoka says Lee Mingwei’s works allow the unconscious everyday rituals of each person to become a source of radiance and light. ‘The sensations, consciousness and memories evoked by visitors’ experiences in Lee’s exhibition will help them to form a new layer of immaterial value,’ she says. Kataoka, a former Walters Prize Judge in 2012, was recently announced as the Artistic Director of the 21st Biennale of Sydney to be held in 2018. She is the first curator from Asia to be appointed to the position. Lee Mingwei and His Relations: The Art of Participation is the first large-scale retrospective survey of the artist’s practice to be presented in Australasia and the first time his work will be experienced in Auckland. It is open daily until Sunday 19 March 2017, except Christmas Day. Lee Mingwei was born in Taichung, Taiwan in 1964 and currently lives and works in New York and Paris. Lee’s works explore interpersonal relationships through participatory installations that examine issues of trust, intimacy and self-awareness. Involving participation from gallery visitors that may occur before, during and after the exhibition, works are relational and rely on audiences to bring them to life and create individual meaning. Lee’s projects are often open-ended scenarios for everyday interaction. The works therefore have an unpredictable quality that allows them to grow and change throughout the duration of the exhibition, relating to the Buddhist notion of the ever-changing present through self-reflection. Lee received an MFA from Yale University in 1997, and is a graduate from the California College of Arts. Lee has exhibited widely, including in solo shows and projects at The Metropolitan Museum of Art (2015); the Museum of Modern Art (2003), the Whitney Museum of American Art (1998), all in New York, as well as the Museum of Fine Arts Boston, Los Angeles County Museum of Art, Taipei Fine Arts Museum, Queensland Gallery of Modern Art, Mori Art Museum, Tokyo; and Ullens Center for Contemporary Art, Beijing. His work has featured in biennials in Venice, Lyon, Liverpool, Taipei, Sydney, the Asia Pacific Triennial (Brisbane) and the Whitney Biennial (New York).